If you’ve taken the first step to mastering your sales and defined your target audience, it’s time to roll up your sleeves and get ready for the next step. It’s time for you to dig deep into that target market and build your B2B lead list. This post is Part Two in a new Masterclass series on how to build your sales pipeline. Building a strong sales pipeline is the #1 key to sales success. That’s why we created this indispensable step-by-step guide, to teach you how to build your pipeline the right way. In this second part, we’ll show you how to get started without getting overwhelmed or spreading yourself too thin on digital platforms. With almost 600 million users, LinkedIn has become one of the most valuable channels for professionals to connect – especially in the B2B domain. 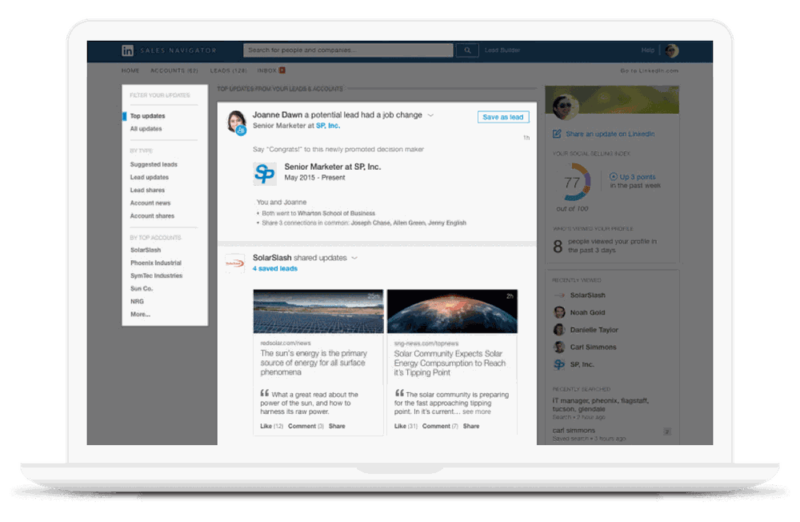 While you could use the platform for active networking and social selling to some degree of success, LinkedIn Sales Navigator has much more to offer to create your lead list. It offers you smart tools that allow you to narrow down your search with filters that define your target market and ideal customer persona, plus it also helps you build a substantial list of prospects. You can further segment this list and prioritize the most relevant leads to your business, leading to a higher number of conversions. Save the contacts you identify or build relations with at prospect organizations in your pipeline. The Sales Navigator will then customize your news feed to display these leads, making it easier for you to monitor the accounts for updates that might affect the sales cycle. For instance, when the organization shares the news of a new board member joining them, you should add them to your lead list, since board members would have a say in the completing of a sale. Saving the leads will help you keep an eye on the accounts, but to ensure that you don’t miss a significant update, set up some triggers. This will help you follow up on a lead or update your pipeline on time. Let’s say that one of the users from your prospecting list joins a new role at a different company. In this scenario, you’ll need to update your contact list at the company you were prospecting in the first place. With millions of users on LinkedIn, running a search on general demographics of your target market will only result in an overwhelming number of accounts to look into. This is why you should make use of the Sales Navigator filters (sparingly) to narrow down your search and find more targeted leads. Let’s look at an example: you’re looking to to reach out to the sales head of a company that has a team of at least 100 people and is based in the UK. Inputting this data along with other filters (e.g. education level) can help you reach the right prospect account in no time. Simply put: use your documented user persona data here! Pro tip: Once you make a custom search for one segment of your target market, don’t forget to save it! The top bar of your search results page is the Sales Spotlight. It summarizes the number of accounts found by the filters you added. What most people don’t know, however, is that clicking on these spotlight summaries narrows down their search, saving you time! Let’s say, for instance, that you set two triggers – ‘people who follow your company’ and ‘people who changed jobs’. Both segments need to be addressed differently, so why look at them together? 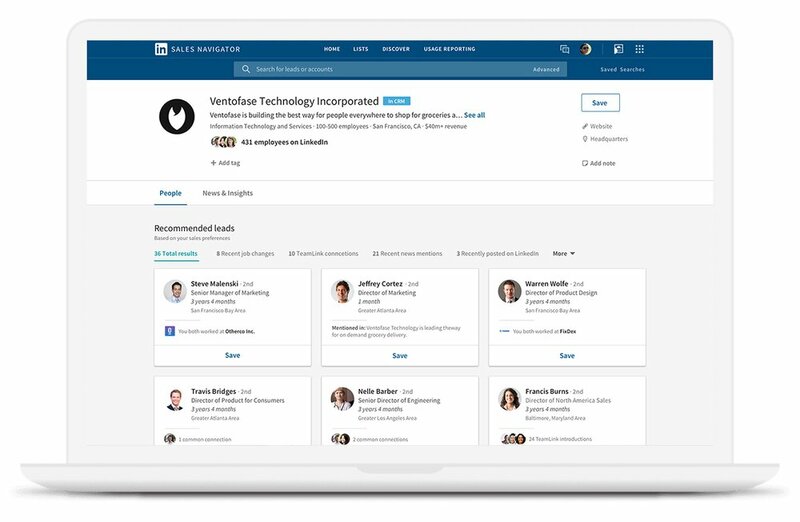 Just click on the spotlight box that shows you the number of leads who changed their jobs, and the Sales Navigator will list down only those for you. Pro tip: Browsing through the different lead and prospect accounts, you can create notes and add tags to the accounts, based on what you need to remember! 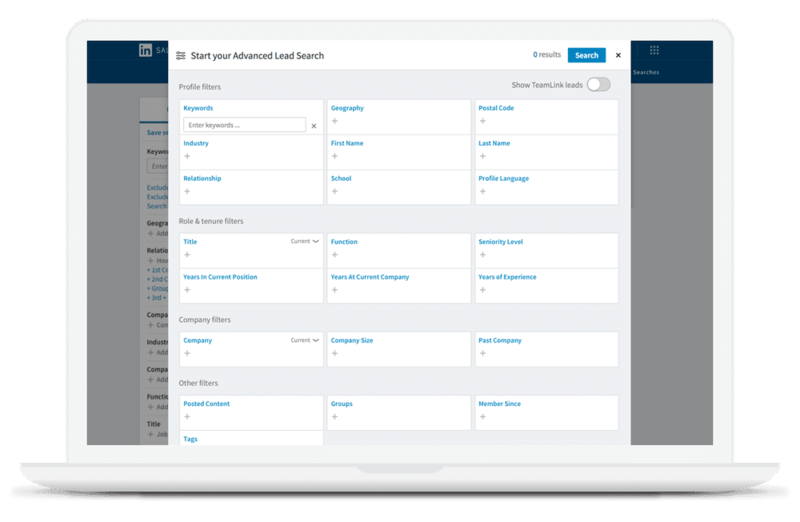 A bluebird search refers to leads that were previously customers of your company, but have since moved into new roles. Using the ‘past not current’ filter on the Sales Navigator, you can search for these accounts by just typing in the company name they were at before. This helps you reach and re-establish contacts with previous account holders who might be willing to refer you in their current company roles. Once you find an ideal prospect account or user, use the ‘view similar’ feature of the Sales Navigator. 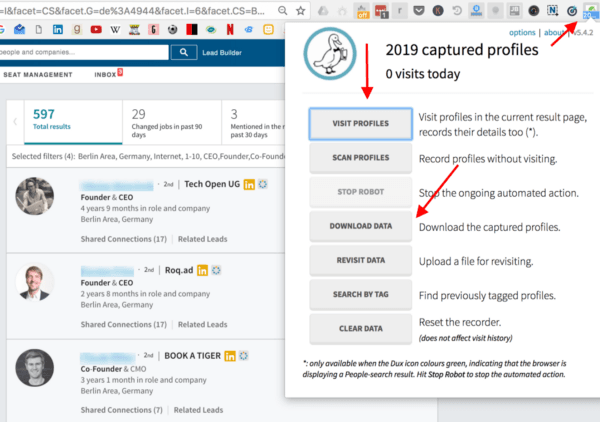 The tool will automatically populate your search results with users of similar backgrounds, titles, and other filters, at different companies. This helps you expand your search while building your lead list. Sales is all about building relationships, and those begin with warm introductions. The TeamLink feature of Sales Navigator helps you identify accounts that you have a second-degree connection with. Rather than trying to reach out directly to prospects, you could use this common connection to secure an introduction. Once you have a list of leads or prospect user accounts you want to contact, start the conversation by dropping them an InMail, LinkedIn’s email or direct message feature. While doing so will get you the account’s immediate attention, you should first review the profile of the lead and establish some engagement between you two – even if that means liking their recent updates so you’ll have something to refer to in your message. While Sales Navigator does all the groundwork for you, actually converting a lead is all on you. That’s why you need to keep your profile optimized at all times. From the headline you use, all the way to your summary and experience, keeping your LinkedIn profile up-to-date and in sync with your outreach will improve the effectiveness of your efforts in building a prospecting list. Pro tip: Don’t forget to integrate the LinkedIn Sales Navigator with your CRM to keep your pipeline up-to-date at all times! Dux-Soup is a little Chrome extension that you can use to automatically visit all the LinkedIn profiles you have listed as prospects. These users will be notified of your visit and most of them will visit you back. The dux will literally help you get new connections, introductions and leads in no time! Take building a B2B lead list to another level by going beyond your defined target market data. Find out what your ideal prospect account’s websites are built on, using BuiltWith. With a database of 30,182+ technologies, the tool helps you search for websites based on the technology they are making use of, their location, traffic, vertical and more. If, for example, you want to target companies who wish to personalize their customer journeys, a simple search on companies using Hotjar will list down all the sites that are using this technology to map their visitors’ movements. 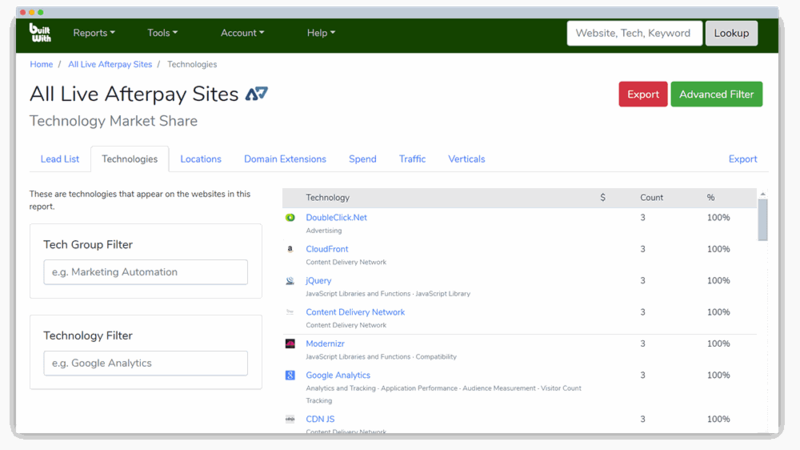 You can also upload your own pre-existing lead list to the tool, and it will list down the technologies they’re using. You can do much more than just share memes with your friends on Facebook, Twitter and other social media platforms. You can actually build out your prospecting list from your connections and their network on these channels. To start with, start spying on your competitors’ followers by joining social groups that they’re also part of. Use this data to either contact users who have shown interest in what your competitors have to offer, or interact with them using social selling – value before pitching your product. Take all those closed Shopify groups, for example. The eCommerce store owners use these groups to ask each other for suggestions, share recommendations and experiences. You can request to join the group, monitor ongoing conversations, identify those relevant to what you do and then chime in with your input. You can put in similar efforts to target your audience on Twitter and LinkedIn, as well as other channels. Are you eager to reap these benefits for yourself? The bottom line is to always focus on having conversations focused on offering value before trying to drive an actual sale. Just like how you fuel your marketing with smart automation tools, you can leverage them to build your lead list as well. Tools like Salestack and Leadfuze give you a springboard to fill up your pipeline with qualified leads. 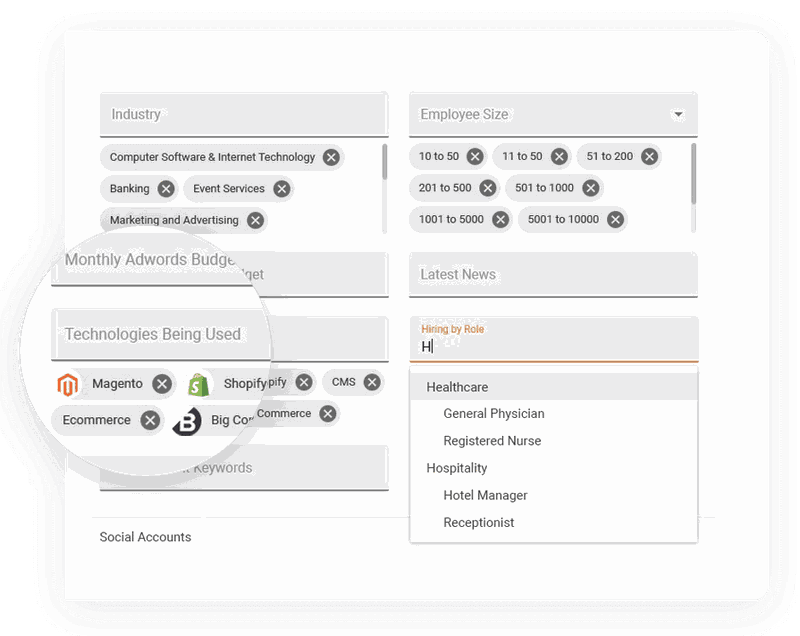 With software like these, you can search for leads based on different parameters. You could search by their roles, industries, software used, total spend on Adwords, and more. The tool then populates your pipeline with data like verified email addresses, phone numbers, social profiles, etc., helping you quickly identify touch points to start a conversation about. What’s best, is that they also have a team of prospecting specialists who can do the vetting for you on the leads you generated. Once qualified, these specialists help you set up the next steps with your leads while they’re warm, driving a higher number of conversions. The best part about these tools is that they integrate seamlessly with your existing CRM, meaning you don’t have to worry about manual data entry to keep your lead list up-to-date. There’s a lot that goes into defining your target market, reiterating it based on market changes, finding prospect accounts that match your personas and turning prospects into leads. That’s why you shouldn’t fret seeking out help from experts! You can seek help with lead research from companies like TaskDrive, or find individuals on platforms like Fiverr or Upwork to do the groundwork for you. Before you hand over the task to them, though, remember that you need to have all your lead criteria data well in place. Your virtual assistants need to be able to visualize your product in the hands of the same accounts as you do, or else you’ll end up losing valuable time and money, building a list that eventually won’t even convert. Most importantly: once you have your target market defined, don’t waste time! You might just end up losing potential customers to a competitor who began building their lead list before you did! 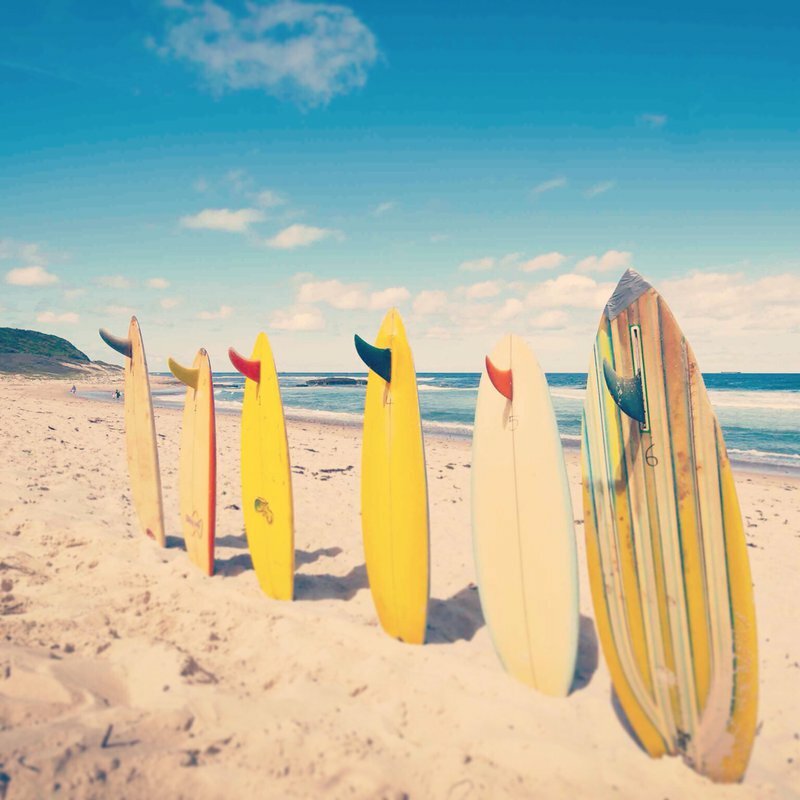 All set to create your lead list and move to the next step? Continue with Part Three in our Sales Pipeline Masterclass: Sales Approach Methods: How To Warm Up Your B2B Leads. Need a refresher? Go back and read Part One: How To Define Your Target Market. I’m a freelance writer at Salesflare, a simple powerful CRM for small businesses. My love for startups and digital has me digging out strategies and exploring tools that can be used for smarter growth. You can connect with me, here.